No photos (and very little information) available. 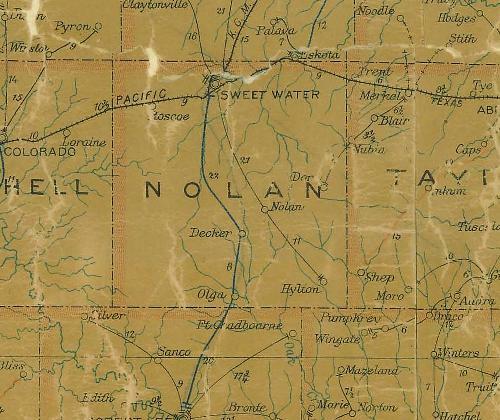 Olga was near the Coke county line in Nolan County. There is no record available how the town came to have such a Russian-sounding name. The community was abandoned by 1940. The first postmistress had the pioneer-sounding name of Annie Parker and apparently liked to link events with holidays. The town's post office opened on Columbus Day, 1892, and was moved to Blackwell on Halloween, 1910. Texas Escapes, in its purpose to preserve historic, endangered and vanishing Texas, asks that anyone wishing to share their local history, stories, or historic/vintage photos, please contact us.